Choosing the right surveillance system is a decision that businesses of all sizes and from all industries face. But as surveillance evolves and software advances, CCTV is bringing business benefits way beyond just security. As a result, making the right choice can have more profound benefits than ever before. 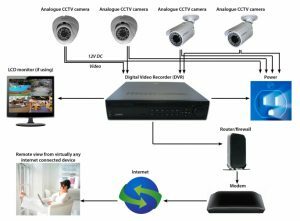 Below are 10 key questions that should be considered before deploying any CCTV security solution. 1. Do the cameras need to be discreet or act as a visual deterrent? The location and what you need to monitor will determine whether obvious or discreet cameras are required. Box cameras can be some of the largest and most obvious, reminding people that they’re being monitored and reducing the chance of theft. Dome cameras are the best to use for discretion due to their small half spherical-shape – the ultra-compact models are so small that they can fit in the palm of your hand. Lastly, PTZ (Pan Tilt Zoom) cameras are good for monitoring expansive areas and following subjects easily. 2. Will the cameras be used indoors or out? Whilst most modern cameras can be used both inside and out, it’s important to consider features such as mounting and housing. For use in extremely cold environments, choosing a camera which has a durable design and an inbuilt heater means it will have the ability to start up and operate despite the temperature. In industries such as transport, for example, it’s also important to choose a robust video surveillance solution which can operate reliably in harsh environments and where there may be a high level of vibration. But it’s not just outside cameras that may need environmental housing. In industrial environments such as factories, for example, cameras may need to be protected from other physical and environmental factors. In restaurant kitchens, ensuring the camera is protected from greases is also important and in bars and clubs, factors such as smoke machines and spilt drinks might impact whether housing is needed. 3. How large an area do you want to cover? The area that you want to cover with a surveillance system will determine the best cameras to use and the network type you need. PTZ cameras work best for larger areas given their large range of view and ability to zoom in on particular activity. In comparison, smaller areas are only likely to require static cameras. 4. How much image clarity and detail do you require? The size of the area you want to monitor will determine the resolution you need. For example, wide retail spaces will require high resolution cameras to ensure image quality isn’t compromised when zooming. Alternatively, smaller areas such as offices or reception rooms will typically only require low resolution cameras. 5. What are the lighting conditions? It’s important to test cameras to see which models work best in the lighting conditions present at your premises. Areas inside and outside will experience different amounts of sunlight throughout the day, not to mention throughout the year as seasons change. Thinking about where the light will be is vital. Thankfully there are a variety of technologies which will ensure you capture usable footage in a range of lighting conditions. Light filtering technology such as IR filters and artificial illuminators can amplify or reduce the amount of light reaching a sensor, creating clearer images during the day and night. Integrating audio into a surveillance system makes it possible for personnel to hear and speak with possible perpetrators. It can be easily integrated with video management systems. From a surveillance point of view it can also be used as an independent detection method triggering recordings and alarms when audio passes a certain threshold. 7. Is scalability key? Will you need to add more cameras as time goes on? Having a flexible and scalable surveillance system is important. The problem with traditional CCTV systems is that they are a closed circuit meaning that everything is hard-wired and difficult to scale.It is therefore important to choose IP cameras which connect over a wireless network allowing you to easily grow and scale any installation as you need. 8. What parts of your business could benefit from effective surveillance and monitoring? Surveillance systems benefit businesses by not only monitoring theft, but increasing staff safety and confirming incidents. With the knowledge that they’re being protected, employees are more likely to feel safe. The portrayal of events provided by a surveillance system is also valuable for confirming incidents such as theft, work place violence, property damage and vandalism. This information is essential when suing for damages or reporting to law enforcement. In industries such as retail, for example, the ability for surveillance systems to provide data and customer insights is changing the way that not only security departments work, but also marketing, customer service and IT departments, providing valuable insights to help vastly improve customer experience and profitability. For example, understanding how customers move throughout a shop is crucial to how products are laid out in the store and advanced features such as facial recognition can be used to estimate attributes such as the gender and age of shoppers. 9. What challenges do you want to overcome with video surveillance? Can VMS (video management system) analytics help? An effective VMS system is essential given that the average amount of time someone can focus on video footage is only 20 minutes. VMS or in-built analytics can alert you to suspicious activity and apply analytics, improving the way you run your business. Built in motion detection and intelligent algorithms provide useful, actionable information, such as the total number of people that walk into a shop. Compared against sales, retailers can assess the rate of conversion and the best times of day for promotions. 10. How do you select a suitable VMS solution ? It’s important that the requirements of a video management system, including how you plan to use it, are verified clearly during the planning stages. The key problems that have driven your purchase of a surveillance system will outline the aspects of a VMS solution you need. As an example, people who travel or have multi sites to manage may require the ability to access their surveillance system from any location. Each VMS solution should therefore be tailored to you and your business. Why not speak to our technical team about our different CCTV solutions. Prefer to talk to someone? Give our expert sales team a call and they will be happy to answer any and all of your CCTV related questions.